Bastrop, one of Texas' oldest settlements, was settled in 1827 as part of Austin's "Little Colony" and received a Mexican Land Grant in 1832. Bastrop was named for Philip H Nering Boegel, The Baron de Bastrop. Turned out that Phillip was not the prominent Dutch nobleman he claimed to be but rather a flamboyant imposter of ordinary Dutch Guiana parents. Philip was charged with embezzlement and fled the country and appeared in Texas in 1805. In Holland, a reward for 1000 gold ducats for return of the accused embezzler went unclaimed and Philip died penniless. Before his death he was the primary negotiator with the Government of Mexico for Stephan F Austin's original Anglo-American colony and he aided Austin and others in establishing other Texas colonies. Bastrop’s historical roots run deep. More than 125 historic structures are listed in the National Register of Historic Places which recently earned Bastrop the title “Most Historic Small Town in Texas.” With a rich harvest of classic Texas folklore and architecture, downtown Bastrop represents a unique blending of the old and new. Main Street is lined with century-old structures housing antique shops, restaurants, and specialty stores. The historic ambiance of downtown is complemented by nearby neighborhoods containing beautifully restored homes. Visit beautiful Bastrop - you’ll discover for yourself why they are known as the “Heart of the Colorado”. Take a Photo Tour here! Bastrop is nestled along the banks of the Colorado River which provides recreational activities for canoeing, boating, swimming, and fishing. 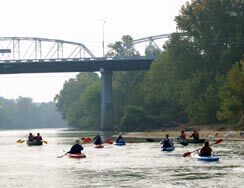 You can get a good view of the river by walking or biking across the old historic Iron Bridge which crossed the river. For more information on Bastrop go to the Bastrop Old Town Visitors Center. There are plenty of accommodations in Bastrop to suite your needs. 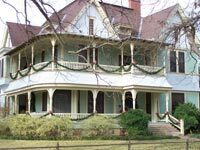 You'll find historic Bed & Breakfast Inns, large cabin facilities, cottages nestled on a golf course, stone cabins in Bastrop State Park, hotels and motels. 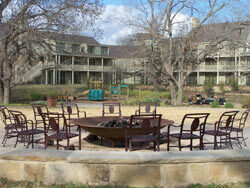 The Bastrop Outside Guide has links for Bastrop accommodations. If you like camping, you have plenty of choices. 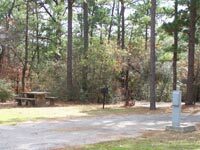 There are a number of private campgrounds in the area, but we recommend either Bastrop State Park or South Shore Park on Lake Bastrop. Both are Texas Outside Favorites: Bastrop State Park has over 8 miles of hiking trails, a swimming pool, a small lake for fishing, and sites nested under the tall pines; South Shore Park has some excellent sites with some of them on the banks of the 968 acre constant level Lake Bastrop which is very good for swimming, fishing, and skiing. 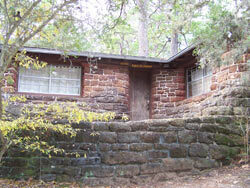 Bastrop State Park has some very cool all stone cabins within the park if you don't want to camp. Rising Phoenix Adventures - stop by Rising Phoenix Adventures and rent a bike and explore the area or rent a kayak and paddle one of the lower Colorado Padding Trails - they also have maps, trial information, and gear. Main Street - Main Street has some very good restaurants, antique shops, and good nightlife - try Maxine's for breakfast and Genuine Oyster Bar for games, cold drinks, and music. The Bastrop Outside Guide has links and information on dining, lodging, and more. Check this site for a list of events going on when you visit Bastrop. The 3rd Saturday of the Month (verify this before you plan on attending), Pine Street is closed down for Market Days.